Pictured is a handcrafted sterling silver mens ring with a free form sleeping beauty turquoise stone. There is also a small sterling cast feather on each side of the stone and a fan going down each side of the ring. Top of ring measures approximately 3/4 to 7/8" long by 3/4" wide. Crafted by a Navajo artisan. 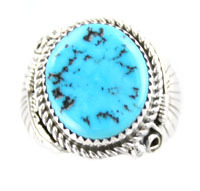 Size and shape of turquoise will vary. Choose size when ordering.